Retail Project Part 2, Nordstrom Salon Shoes » Good Morning, Seattle! They’re so beautiful and they fit so perfectly. They were also way out of my price range. 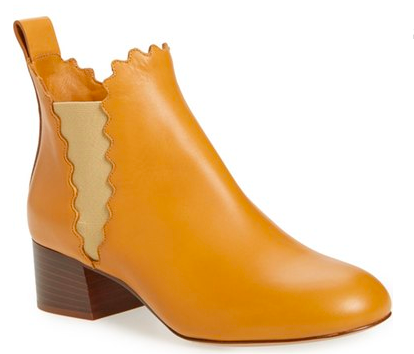 There was a brief moment where I thought I might be unreasonably impulsive and buy them anyway, but the ONE detail that saved me was that the Pikolinos I had picked out in the BP section were very similar and their color suits rainy Seattle weather way better than the Chloes. Whew! However, these boots do have a happy ending in our story – Pam ended up buying a pair! They suited her incredibly well! The only issue was that they were limited on sizes and we weren’t sure which size she needed. This is an example where the service was amazing. Andres ordered the OTHER size to Pam’s home and put the in-store size on hold for her. In a day or so, when the shoes arrive, she’ll be able to choose whichever pair fits the best – or decide if maybe she doesn’t want them at all. There was a third pair of boots Pam was considering – a fun pair of Chanel booties, black leather with gold flecks (I’m having a hard time finding them on line to provide a visual) – that fit her pretty well, but awesome. Andres actually discouraged her from purchasing those boots since the fit wasn’t perfect. He was clearly much more interested in keeping her satisfied in the long term than making another immediate sale. I was thoroughly impressed. Once we were all squared away with shoes, we asked Andres who would be the best person to help us. They were remarkably short staffed so Andres began helping us look for dresses! See? He was seriously amazing. As mentioned above, couture clothing was short staffed, so when we did find a sales person in that section to help us, she had to divide her time between us and a few other customers. (As a reminder, Pam was looking specifically for short, fit and flare day dresses with pockets.) The sales woman did genuinely TRY to find what we were looking for, but they just didn’t have it. My major issue with the experience is that she kept bringing us dress after dress that did not fit the criteria. Many of the dresses were cocktail dresses, or shaped like potato sacks, or did not have pockets. Instead of just telling us that they didn’t have what we were looking for, she just kept bringing us the wrong dresses. She even recommended just finding a dress we liked and then having pockets put in… Um…? In the spirit of the experiment and good fun, Pam tried all of them on. The game became even more fun when we realized that despite our different heights and body types, we wear the same size dress! We both tried everything! Dresses that were an acceptable length on Pam were ridiculously short on me. And there were many that were just hilarious on both of us. I really wish we had taken photos of us trying on all these dresses, but we didn’t even think about it until we had already left Nordstrom! Over our Pad Thai lunch, we wondered if fit & flare day dresses with pockets were really THAT hard to find. I assured Pam we’d find something good at Macy’s…after all, they dedicate half a floor to just dresses!